Former Rockland High School football coach, Rockland mayor and state legislator Ed Mazurek died on Wednesday at the age of 79. When Jim Leonard played for the Rockland District High School football team, head coach Ed Mazurek and his staff used to run a drill at the end of practice. The drill Mazurek employed involved the players getting in and out of the huddle as quickly as possible and clapping their hands at the exact same time. “After the ball was snapped, we would take one step and clap and it had to be in unison. And we had to do it (correctly) 10 straight times or we would start all over. I remember there were times when the coaches would drive their cars up to the field and turn the lights on (until it was performed correctly),” recalled Leonard. 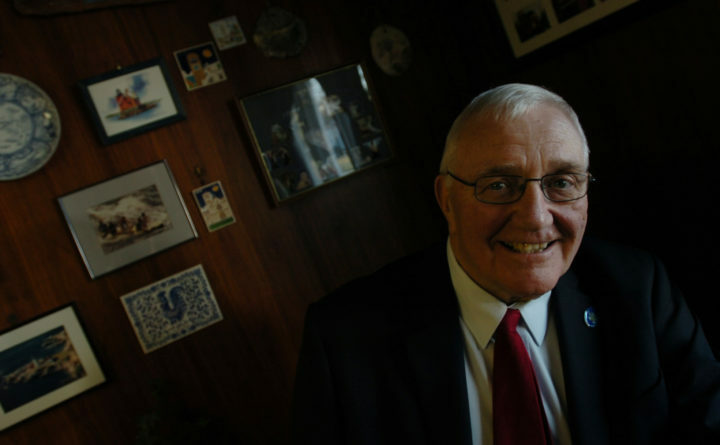 Mazurek, who also served as Rockland’s mayor and as a state legislator, died Wednesday at the age of 79. “At the end of the fourth quarter, we would snap in and out of the huddle like it was pregame. I remember players on the other teams shaking their heads as we were popping out of the huddle as fresh as daisies,” said Leonard. And they actually were fresh, because Mazurek believed in conditioning. “We were in shape,” said Leonard. He went into the U.S. Army Special Forces (Green Berets) and said the Rockland football and basketball practices were more strenuous than his military training. Mazurek inherited a program that had gone winless, but within a few seasons, he transformed the Tigers into a team that played in back-to-back LTC championship games during Leonard’s junior and senior seasons. Leonard said Mazurek had an infectious energy and it positively impacted the football program, the high school and the town. “He invested in the youth. He really loved kids,” said Leonard. He also had a presence that revitalized the football program. “When you have a guy who is 6-foot-8 and who played for the New York Giants, when he stepped on the practice field, kids took notice,” said Leonard, who is the athletic director at Maine Central Institute in Pittsfield. Mazurek was able to get the players to believe in him and his vision. “He knew what he was doing, he was confident and he told us if we accepted his coaching, we’d get this done. And we did,” said Leonard. Mazurek’s son, Rich Mazurek, who had an exceptional athletic career at Rockland High and Bangor’s Husson University, talked about his dad in a 2016 Bangor Daily News story. “I was the manager of his football teams when I was little, so I was always in the locker room and my dad was known for the pregame speech,” said Rich Mazurek. “I can remember listening to him giving those pregame speeches when I was 5 or 6 years old. But Ed Mazurek was much more than just a football coach. He also coached softball and was a well-respected politician. He served as the mayor of Rockland, was a member of the city council and served in the Maine House of Representatives and Maine Senate. The Stamford, Connecticut, native, who was a devoted family man, moved to Rockland in 1975 to take jobs as a social studies teacher and football coach. He played on a Little League World Series championship team as well as a Babe Ruth national championship team. He went on to play football at Xavier University in Cincinnati and played for the St. Louis Cardinals before being traded to the New York Giants. He eventually earned a degree in education from Fairfield University and his first job was at Central Catholic High School in Norwalk, Connecticut. He coached four sports there. State Sen. David Miramant, D-Camden, said in the story that Mazurek was a mentor to him. “He was a big advocate for the community. He would speak with the power of that passion and people would fall in line,” said Miramant.